Turkey contains not only rich history and culture, but also some of the best cuisine in the world. During my spring break visiting Istanbul and Cappadocia, I ate some of the tastiest food I have ever had in my life. I highly recommend going to Turkey. You will meet wonderful people, experience lively culture, see breathtaking architecture, and eat delicious food worth every calorie. Baklava honestly tastes like a slice of heaven. Layers of filo dough are filled with chopped nuts (usually walnuts or pistachios) and sweetened with honey. 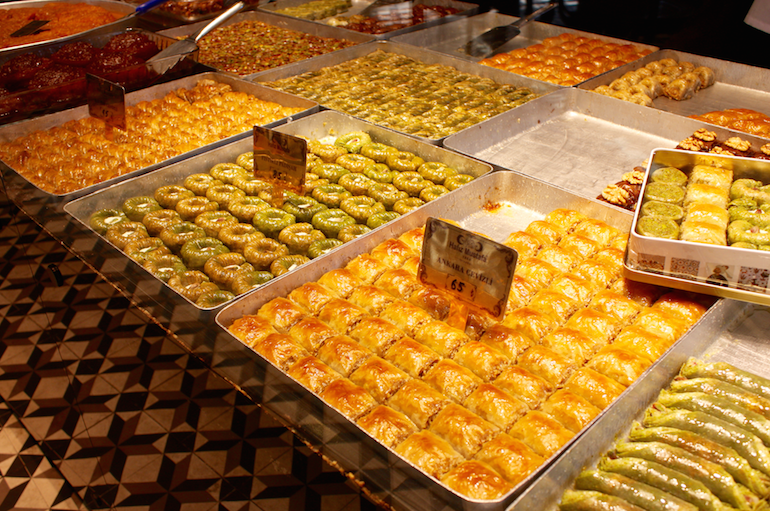 Baklava is the most delicious, rich, sweet treat. It is impossible to go to Turkey without eating lokum, more commonly known as turkish delight. Traditional turkish delight consists of chopped nuts (usually pistachios or walnuts) and dates bound together with a sweet, sometimes flavored gel. You can find it everywhere, especially in Istanbul. The spice bazaar has multiple places selling fresh turkish delight. 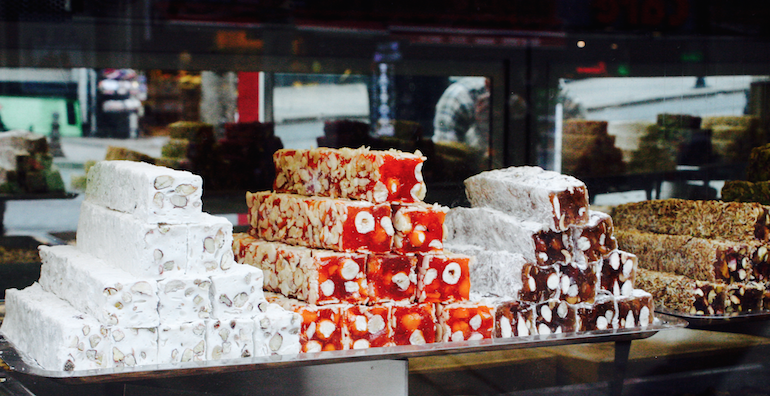 As you walk down the streets you will see shops with stacks of turkish delight beautifully presented in the windows, inviting you to indulge your sweet tooth. Every great food culture has a unique ice cream. 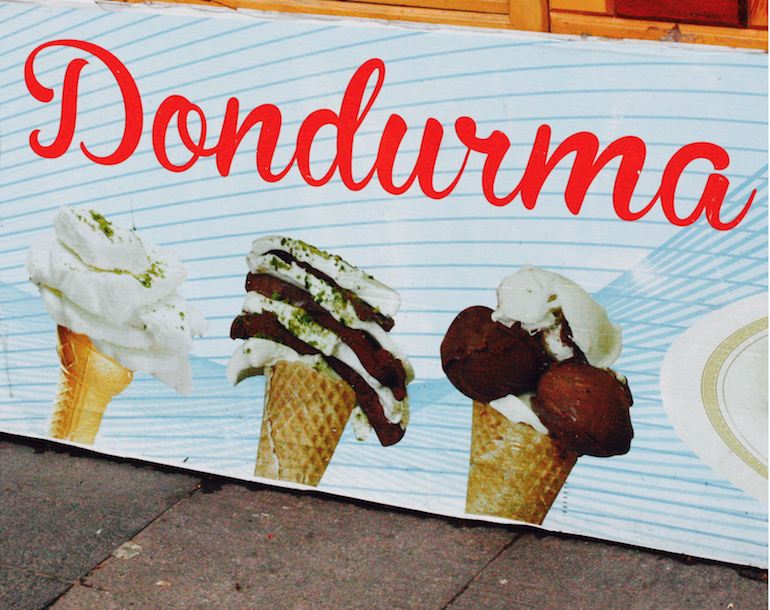 I have had gelato in Italy, but dondurma might just top it – please don’t shun me. Made with goat milk, salep (a type of flour), mastic (a sap-like substance) and sugar, it has a lovely, thick and creamy texture and it is somewhat chewy. Its texture and resistance to melting distinguish it from other types of ice cream. Street vendors who typically sell dondurma, like to play tricks on customers to highlight the unique texture of the treat. Tiny, but mighty, turkish coffee and tea manage to fit rich taste into small cups. To make the coffee, roasted and finely ground coffee beans are simmered in a pot and served in a cup where the grounds are able to settle. I know what you’re thinking, grounds in the coffee? I am not going to lie, the consistency of the first sip came as quite a surprise, but it grew on me. The coffee is served in small, classically decorated cups. Sipping this rich drink and people watching is a great way to unwind after a long day of sight seeing. Turkish tea, called çay, is even better than the coffee; and it is definitely a more popular drink among Turkish natives. It is usually some type of black tea served without milk – you can add a sugar cube or two if you want to make it sweeter. My favorite part about drinking the tea was the adorable, transparent glass cups. They made me feel classy. Walking in Istanbul in the morning, the smell of warm, fresh-baked simit permeates the streets. 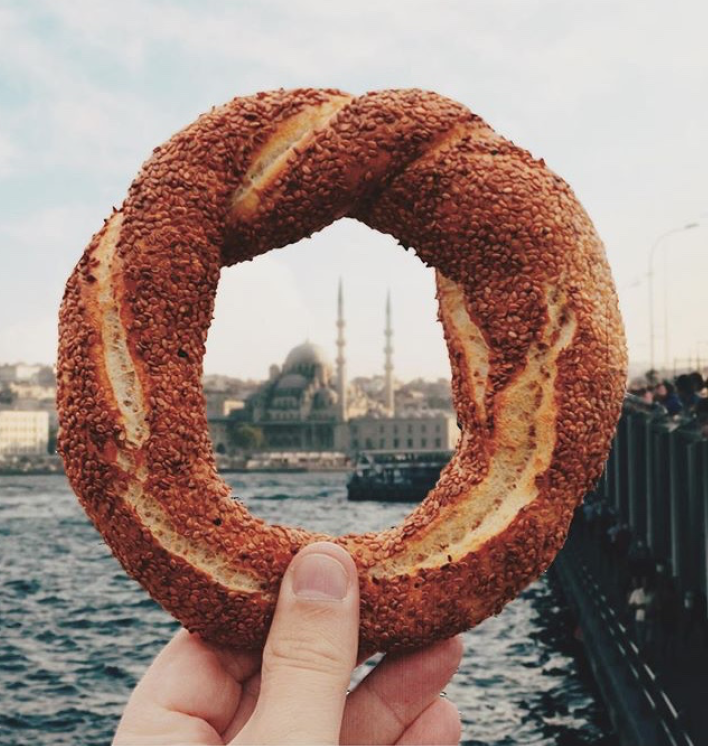 Simit is bread encrusted with sesame seeds and made with molasses. If you are a bagel lover, you will be infatuated by simit. Whether you enjoy it with with coffee or çay you cannot leave Turkey without trying one. 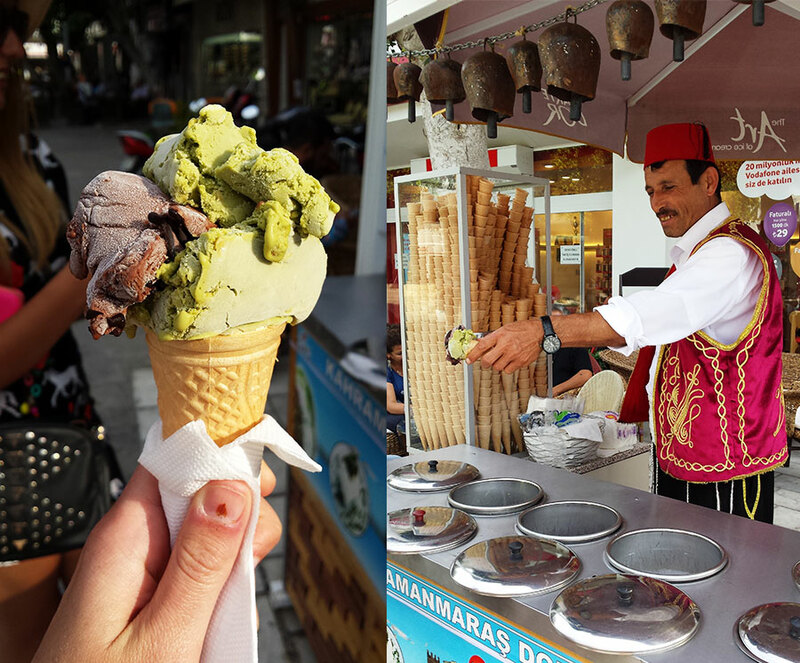 Yes, Turkey also has plenty of delicious savory foods and meat dishes, but as a person with a major sweet tooth, these were the tastiest things I ate during my week in the lovely country. Whether you are planning your next trip or considering places to go on weekend excursion while studying abroad, consider adding Turkey to your list. Your taste buds will surely thank you.